Accounts Receivable High, Cash Flow Weak? Every company strives for higher sales, however this does not always immediately equate to higher cash flow when you need it. In an ideal situation, customers pay when goods or services are delivered, or at least on time if you have offered terms, but frequently this does not happen. Any reserve cash may need to be used for a multitude of tasks such as inventory building, expansion, and unexpected bills. 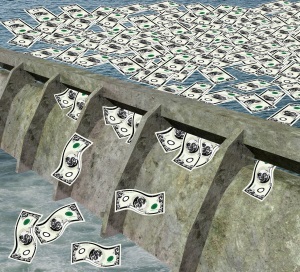 The end result can seriously compromise your cash flow. Balancing the books at the end of the day can become an onerous task. Add to this, those customers who pay late, or those occasions where they have been invoiced incorrectly, and the invoices have to enter a new payment cycle round, and problems with cash flow grow quickly, and become hard to solve. This is where invoice factoring can be a serious financing tool as it provides a great answer to the cash flow dilemma. High numbers of outstanding invoices are the perfect foil for a successful relationship with a factor. Selling your accounts receivable to a factor in return for immediate working capital has become a popular financing tool for companies both large and small. The best part is that businesses improve cash flow without having to add a burden of debt. Invoice factoring is not considered to be a loan; it is the purchase of your invoices. As such, factors are concerned about the creditworthiness of your customers when making a decision. A bank decides whether to offer a loan based on your company’s credit history, collateral and cash flow. Factors can fund quickly, often within days of receiving an application; banks usually take much longer. No loan, no interest, no principal to pay down. It is a proven, and widely accepted way of financing operational expenses and helping with company growth. So how does it work? Factoring companies purchase your current outstanding invoices for goods and services that have been delivered to your customers. Factors verify the invoices to confirm their validity and check there are no issues that may interfere with payment. Cash is then advanced to you up to 30-90 days prior to invoice payment from your customer. So when you find that you have plenty of outstanding invoices, but you are short on cash to cover the company bills each month, factoring these outstanding amounts can provide the answer you have been looking for. Bay View Funding has been providing cash flow solutions for more than three decades. If you feel that invoice factoring could answer your cash flow issues, or you are simply interested in finding out more, the friendly team at Bay View Funding would love to chat with you.